The Kest-Lock unites the advantages of a traditional TC-clamp with an aseptic tank connection, in a new innovative design. 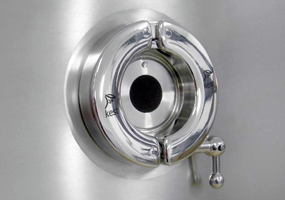 Kest-Lock with the unique quick coupling and the aseptic weld-in flange gives a flush surface inside the tank. It is developed for critical applications where aseptic design, easy and safe handlings are essential, such as SIP/CIP processes. Kest-Lock is developed with focus on the aseptic demands and user friendliness. The operation of the Kest-Lock requires no tools for connect or disconnect equipment. The design of the snap-rings makes it easy to connect equipment with a safe and simple snap action.